While RVing, for the most part, is a relatively safe lifestyle, it never hurts to take a few precautions because you never know where an adventure in RVing may take you. The following are six tips to help keep you safe while enjoying your RV. 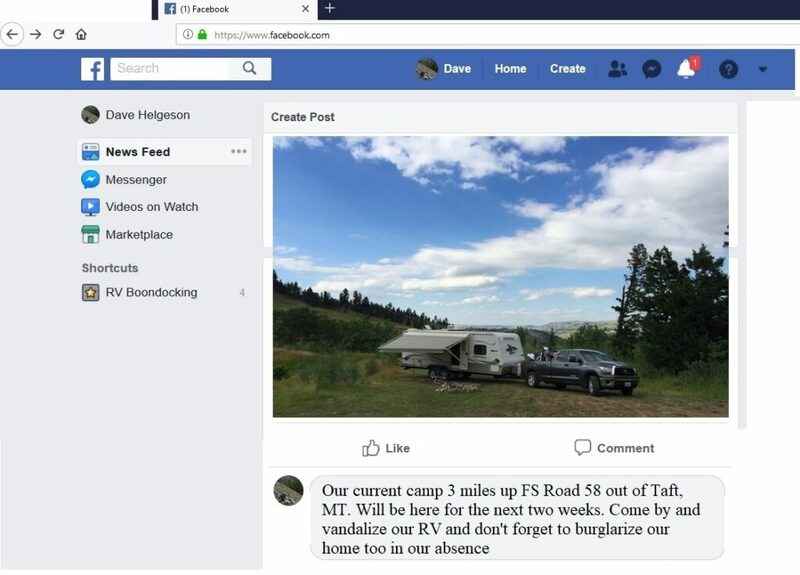 While it’s tempting to post pictures on social media of your cool campsite, either in a campground or in the middle of nowhere, it lets people know (possibly criminals too) your current location and more importantly that your home is vacant. 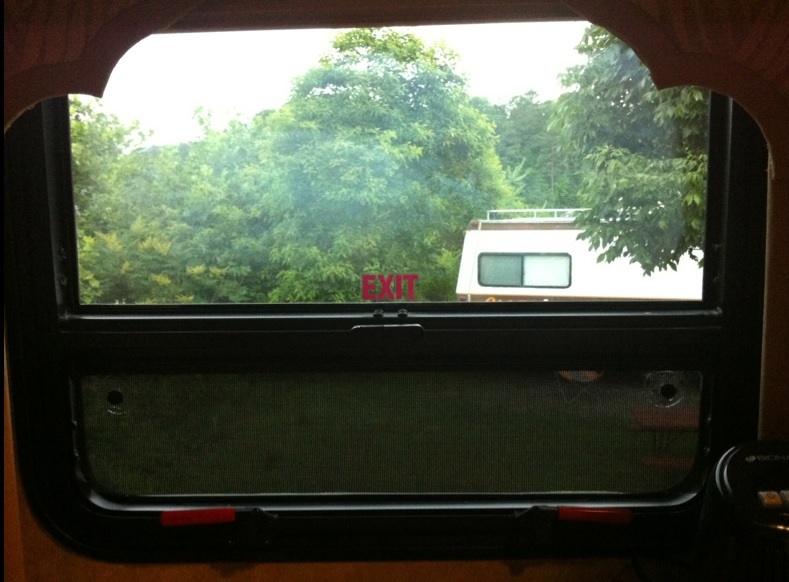 Do you know where the emergency exit windows are located in your RV (emergency vents in some truck campers)? Do you know how to use them in the event of an emergency? Gather the family and take the time to practice removing the window screen (if so equipped) and opening the window. Are you and your loved ones physically able to climb out through the window if needed? If not, think about what other items you might carry to make this possible. Does your RV have more than one entry door? Many RVs have a secondary entry door that is seldom used, if ever, by the owners. To save time when setting up camp, the owners will often leave the steps in. Two potential safety issues can arise due to failing to extend the steps. In the event of an emergency (say a fire blocking the primary entrance door) and you have to use the second door, are you going to remember the steps aren’t deployed, potentially risking falling out of the RV? Do you ever have guests (say grandchildren) traveling with you? Are they going to remember the steps aren’t deployed on the second door? 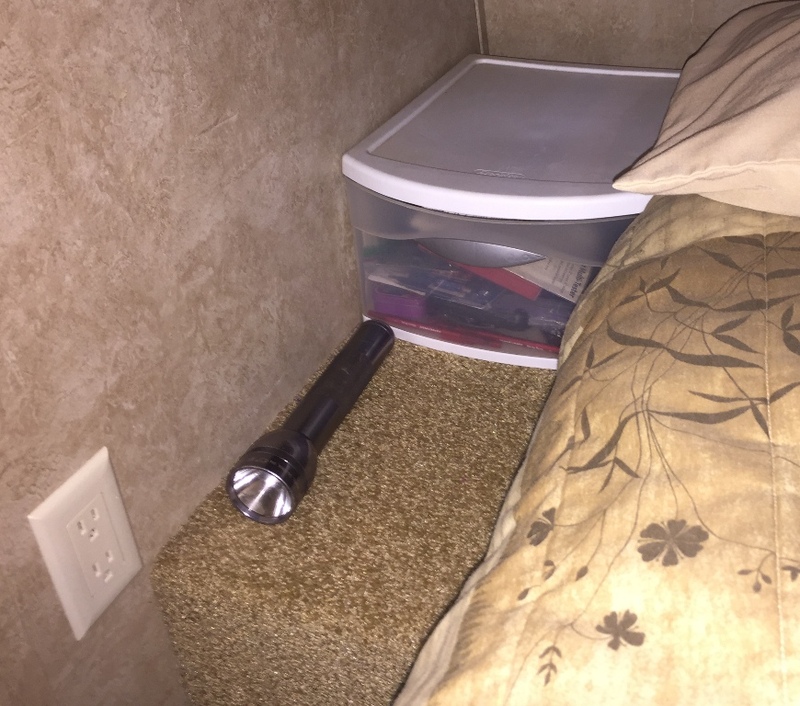 Keep a flashlight handy by your bed stand or door. You never know when your electrical system might fail or you need to light up someone outside your RV’s door when a knock comes after hours. 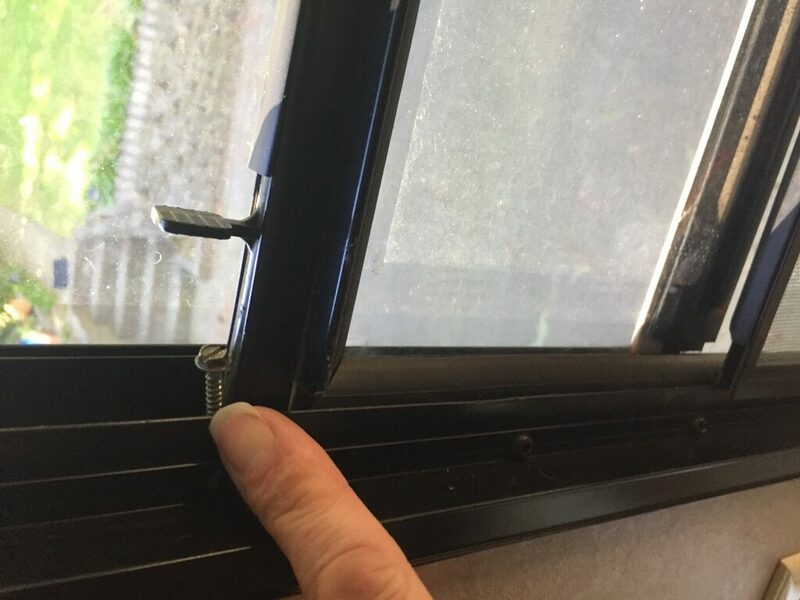 Just like at home, it is a good idea to secure sliding windows with a dowel rod in the track or install a screw limiting how far the window can open to discourage intruders. Do you carry a firearm for personal protection when you travel? Surveys indicate more than half of RVers do. Whether you do or not, it’s best to keep it to yourself and not share with others. If you keep others guessing it will statistically be assumed that you do. Employing these tips will help keep your next adventure in RVing a safer one. Good suggestions. Glad you mentioned the firearms issue. That is the reality of it. Your RV is an extension of your home. By Law. You have a legal right to protect it and those inside with lethal force if necessary. Many State and Federal Parks may tell you otherwise. So if you put a screw in the exit window, that pretty much would render the escape impossible. And if you rely on screws for security in the windows, but don’t put one in the exit window,, thieves will only go to the exit windows to gain access. Generally, exit windows open out with release levers. It isn’t a sliding window so the ‘screw in the track’ suggestion has nothing to do with exit windows. Unless your house is a particular target for burglary (you live in a dangerous area or you have very valuable possessions), it very unlikely that thieves would get your location from Facebook or other social media. And if they did, how would they know you don’t have a housesitter, or someone stayed home while you travel? This suggestion and the “screw in the window” suggestion are a bit paranoid. I have no comment on carrying a firearm – the stats are out there. and I don’t want to get flamed. Having your secondary door stairs deployed is a good idea but more importantly make sure that the hand rail is deployed also or you can’t escape out that door. i would just go to a hard wair store get 3/16 dowl & lay it in the window track..
i have never been broken in to but it’s never out of my sight…..
we cable our gen in the bed of our truck..lock it up…. close all the window’s some times leave our doberman pincher and his buddy’s be hind..
i have set up game cameras in the tree’s an what not ..
re: #1. Just stay away from social media. Problem solved. What would be the problem of putting an NRA sticker on your door? Suzanne, perps looking for firearms can then be somewhat assured there may be some in your RV. Also, with today’s overzealous and misdirected anti gun atmosphere, vehicles have been defaced for sporting pro gun decals and stickers such as NRA emblems, firearms maker decals, etc. It’s been happening in California, especially to those with NRA stickers. Exit window is usually not a “sliding” window. Go ahead and put a screw in the exit window because you open the entire window on a hinge released by a exit latch.You do not slide the window open to escape. good things to think about,but every example has their own exceptions, be realistic about your own situations. Good tips! We’re new RVers so soaking everything in. Good response on not putting the screw in the exit window. Maybe a rod instead? We have RV’D since 1975, both in England, Canada, Mexico and the US and never had a single problem, yes we take precausions, but have never found the need to carry guns, being street smart is far better than killing someone. Oh yse we have owned 23 RV’S, camped in rest areas (where allowed) truck stops, Walmarts, resturant parking lots, all with the permission of the person in charge. Camping is to be enjoyed not sitting there frigtened to move or venture out. We have watched in amazement, people locking everything, then pulling down the blinds, even locking their door evey time they enter or exit their RV, MUST BE TERRIBLE TO LIVE IN SUCH FEAR. But we believe its the fact they carry guns that bribgs on the fear of every stranger in a campground, very sad. Yes we are devout christians. One does not have to always depend on a firearm in most cases. One option is a flare gun which will not kill someone but scare the daylights out of them and possibly burn them also. Another option is to just buy a bee bomb for around two dollars……it will shoot up to 20 feet and render them helpless. The first comment is entirely correct…Keep your travel plans private until after the trip. Not only do local criminals browse neighborhoods (and find our who lives where), but they also browse social media of the people they have identified in their neighborhood recon. I am not paranoid, but I am realistic and cautious. Wow, am I sorry I ever commented on this. I have learned that folks see the world entirely differently. Some RV people see threats around every corner, burglars waiting and watching to break into their home or RV, steal their stuff and cook their cat for dinner. Others, more like me, think that people are basically decent, break-ins are very rare, have never had a problem, and that owning a gun would be a bigger threat to me, friends and relatives and other campers that it would provide protection. Besides, I’ve nothing worth stealing. Byron, I’m with you. I’m 75 and about to embark on a 6-8 wk. road trip across the US from Canada, where I Iive. I will be trailing my little Trillium Egg. I wasn’t at all nervous until I read the gun comments!! It’s daunting to think that anyone I meet down there might very well be packing heat. and harboring dark suspicions besides. How horrible! I grew up in the Midwest but have lived in Ontario for 40 years. For the life of me, I can’t understand Americans’ current resistance to sensible gun legislation. Having all those things around in so many fearful, untrained hands makes life MORE dangerous, not less. A flare gun? Oh, please!!! Don’t have a gun if it scares YOU, but please do not suggest others should be so denied. House fires are rare too, but most sensible people have fire insurance. Better to have a gun and not need it, than to need one and not have one. Getting training is a very good thing to do. Great that some have traveled and never had a problem. Most people are good and decent, that is true. However, it only takes ONE bad person to ruin lives. In remote areas, law enforcement can not protect you. Wolves only chose the weak sheep. I hope and PRAY, your luck holds out Mr. Abbott. More guns! More guns! That’s the solution to the country’s problems (and RV safety). At least according to the NRA. Don’t want to own a gun for protection, fine, don’t. No one is forcing you to own one. It is probably safer for the rest of us you if you don’t! However, you have no business telling those of us who do want to protect ourselves (and possibly you as well) not to exercise that right.